My housemate went away for the weekend… leaving me to my own devices. So I tried having the furnace and all space heaters off for 36 hours (Friday eve to Sunday morning), just to see what would happen. We were at the tail end of a cold snap on Friday (below zero F), but now it’s warmed up considerably outside, to 18F/-8C. b) Metabolic body heat of myself (roughly 100W) part-time and three well-insulated cats (estimated total 40W) full-time. a) The electric blanket: Used at half-power (approximately 90W) about 8 hours each night– Friday night on the sofa in the bunker, Saturday night in bedroom. And here’s the graph of temps outside, in the kitchen/bunker, and the bedroom. As you can see, the house really doesn’t cool off very fast. Saturday morning the bedroom actually warmed slightly, of its own accord, which is mysterious– could be because it gets some morning sun? 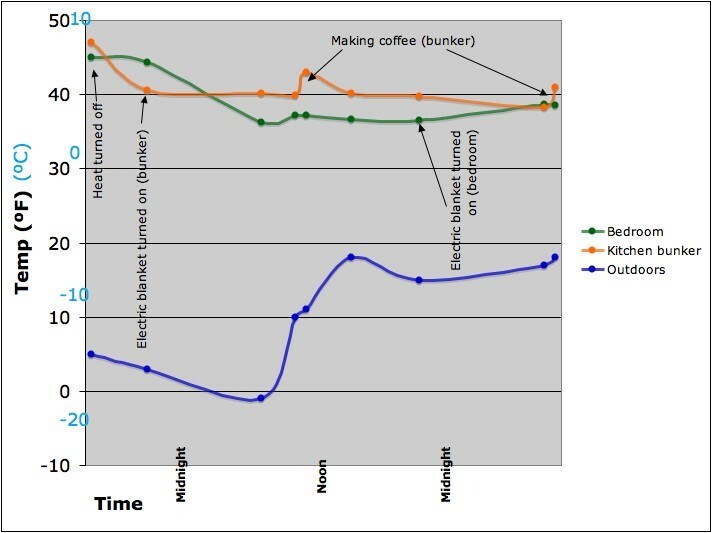 You can see that making coffee has a rapid effect on the air temp, though in terms of actual heat this is pretty trivial and is rapidly absorbed into the tile and steel heat-sinks of the kitchen. The electric blanket kept me extremely warm (I had to turn it down several times last night), in spite of using only a lightbulb’s worth of electricity. Interestingly, the e-blanket set on 50% power has roughly the same warmth as another human being sharing the bed… perhaps not a coincidence. This entry was posted on January 18, 2009 at 3:47 pm and is filed under General updates, Hard data. You can follow any responses to this entry through the RSS 2.0 feed. You can leave a response, or trackback from your own site. I wish I could lend you my dog. She radiates heat. She’s a fuzzy wheaten terrier, and I’ve let her hair get long in the past couple of months, and it is shocking how much warmth she provides. It was cold this weekend (lows between 15-20 F – which is extreme around here) and I let her sleep in the bed with me, and I was SWEATING in the middle of the night – I had to make her move. Which confused her because she really wanted to snuggle. I live in TX with a husband and a dog (approx 40 lbs.) We recently bought a 50 yr old house and have been experimenting with how little we can run the heat and be comfortable, compensating with blankets or sweatshirts. Our beloved dog’s winter bed is a beanbag chair with a towel and two pillows, to allow for burrowing if he wants to make a nest. He’s allowed on our bed after 6 am. We’ve found that we are totally fine using almost no heat, and though I know that it’s nothing – no-thing – compared to the cold you guys deal with up in New England, we have also found that it is fun to experiment with the bounds of low energy usage.